This week we take a break from having a guest on the show and Gary and Byron talk about making changes to your BJJ game. 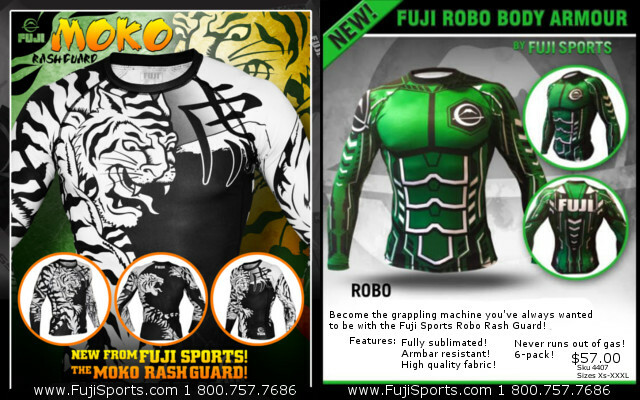 Enter to win one of these great Fuji Sports rash guards. Leave a comment on this episodes page. Facebook- Go to our Facebook page and comment, like, or share this episode or the picture later in the week of the rash guard. Double your chances on Facebook by changing your profile picture to the rash guard picture. This entry was posted in BJJ Results, BjjBrick, BjjBrick Podcast and tagged BJJ changes, BJJ style, bjj tips, changing your game, fuji sports, rash guard moko, rash guard Robo by byronjabara. Bookmark the permalink.